In the online age letterbox distribution might seem old hat, but it’s one of the best marketing tools on offer in the real estate industry. Latest research from Roy Morgan shows the number of people reading catalogues is on the rise, with 10.5 million Australians reading catalogues during an average week. 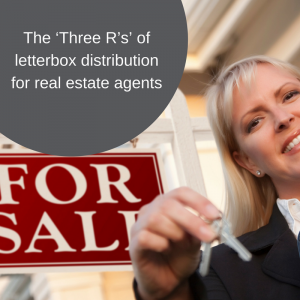 Here’s why the three Rs of letterbox distribution will send your business to the top of the class. Catalogue reach is expanding – more Australians now read catalogues during an average week than local or community newspapers, or even major publications! The latest research from Roy Morgan shows catalogues are bucking a downward trend, with reach actually increasing. Roy Morgan predicts the number of Australians reading one or more catalogues a week will continue to grow from 11.1 million – that’s more than 54% of Australians. Their research shows that catalogues reach over 600,000 more readers in an average seven-day period than non-community newspapers, and around 4.3 million more than local/community newspapers. It can also help you tap into the lucrative renters market. The 2016 Census shows renters on the rise at more than 30% of Australians. That’s around 3 million homes with residents potentially looking for their next rental property (ABS). Flyers offer the chance to tell a powerful story to a targeted audience. You can shape each offer to capture people’s attention and appeal to what drives them – an aspirational photos of a stunning view, the perfect price point or more space for an expanding family. With more than 7.4 billion pieces of direct mail delivered to Australians in 2016, new targeting technology can help us ensure you’re telling the right story to the right people. Identifying their common features and pain points, and cross mapping geographic locations means your content can be highly targeted and effective. Just one sale can more than cover the cost of your investment in letterbox distribution. Consider the commission on a $1 million home vs the cost of creating and distributing of targeted flyers. Strong reach and high readership means the chance of at least one listing is significantly increased, delivering spectacular ROI. Australians rank direct mail in the top five most effective channels and the top three print media to reach people intending to buy a house in the next 12 months (Roy Morgan). So far from being old fashioned, letterbox distribution can be a powerful and effective way to reach homebuyers, sellers and renters. Consider the impact of the Three Rs when planning your next marketing campaign.